Lake Vostok in eastern Antarctica may not be sitting on a quiet craton as most scientists, until now, had thought. Airborne reconnaissance and seismic studies of Antarctica show that the land under the world’s largest subglacial lake is an active geologic boundary. The news puts a fresh perspective on the central region of East Antarctica, until recently the site of few radar studies and no direct seismic studies. The latest research, reported at the annual meeting of the American Association for the Advancement of Science, also put a spin on models of the circulation in Lake Vostok. Robin Bell of the Lamont-Doherty Earth Observatory at Columbia University in New York announced the findings at the meeting. She and Michael Studinger, also of Lamont, were principal investigators on the project. Studinger had spent 33 days from mid-December to mid-January at the Vostok station monitoring the East Antarctic ice sheet for earthquakes. As part of the project, pilots from Kenn Borek Air flew a Twin Otter aircraft with ice-penetrating radar and instruments operated by the National Science Foundation’s Support Office for Aerogeophysical Research (SOAR) to record gravity and magnetic signals under the sheet. Unlike Antarctica’s active western peninsula, where an earthquake strikes every two to three days, temblors are in short order in East Antarctica. During the last century, only three were known to have hit the region and those were teleseismically recorded using instruments on other continents, Bell said. On Jan. 5, Studinger caught the first local recording of an earthquake east of the Transantarctic Mountains. The one functional seismometer, of the two Studinger brought, indicated the magnitude was between 2 and 4 — not enough for anyone at the Vostok station 290 kilometers north of the epicenter to feel the quake. But the tremor was only the “first blush” of the active seismic boundary, Bell said. Aerial transects showed that the Vostok highlands follow a geologic pathway with the Gamburtsev Mountains to the west reflecting low gravity signals and the Aurora Basin to the east giving off high gravity signals and a magnetic signature. That rocks on either side of the lake are different might indicate a younger rifting area, analogous to the rifting zone of East Africa, in the middle of what is otherwise a stable formation, Bell said — although she added that this conclusion remains uncertain. The dynamic seat may also be introducing frictional energy under the lake. The ice-penetrating radar, which details the internal layers of the ice sheet, showed freezing and melting rates three times higher than any previously known at Lake Vostok, Bell said. Internal layers grow away from the top of the lake when water from the lake freezes. “It’s clear the lake is not just at a steady state. Ice is riding and melting at the edge and freezing on the other side, creating a complex process,” she said. The detailed airborne survey had confirmed Bell and Studinger’s suspicions. “Robin and I were thinking for a while there must be a geological boundary across the lake,” Studinger said. “There must be a significant structure in this part of Antarctica, which is the reason Lake Vostok might be there.” Projects from the International Geophysical Year of 1957 and ice-penetrating radar taken during the 1970s showed some clues that the rocks sitting just on either side of Lake Vostok, yet to be unidentified then, might be different from each other. 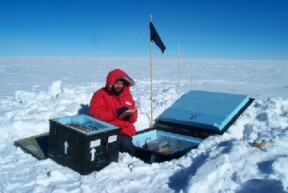 In the next year, Wiens and researchers from the University of Alabama and Pennsylvania State University plan to deploy 30 to 40 seismographs along East Antarctica from McMurdo Station across the Transantarctic Mountains. “We will not go over the Lake Vostok area but if the rift that Robin thinks she sees there continues laterally, then it may intersect our line. “We know so little about East Antarctica, everything we can learn is quite important,” he added.